[JULY 26, 2001] Logan County has become a varied picture in agriculture over the past few weeks. With critical timing from the first week of July to date for corn, much-needed rainfall fell in some areas. Other areas were virtually shut out. 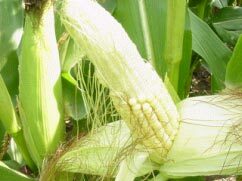 Pictured below is an ear of corn with poor pollination due to heat stress at a critical time. 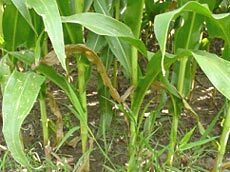 Also noticeable in area cornfields was the firing of lower leaves due to the heat and moisture stress, as plants protected themselves and continued filling kernels on the ear. 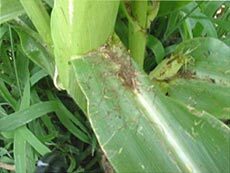 Insect damage was also seen, with rootworm beetles causing some silk clipping and corn borers riddling some stalks. Soybeans have a critical point approaching as they start the pod-fill period. They continue to bloom, set pods and begin to make the seeds grow. 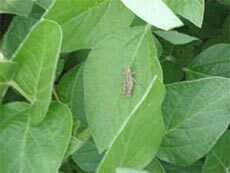 Many insects, such as bean leaf beetles and grasshoppers, have caused some minor defoliation in the soybean leaves. 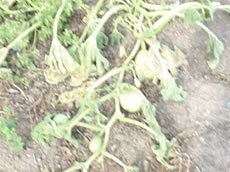 For the horticulturalist in us, we have seen the wilt virus transmitted by beetles in the cucurbits, such as pumpkins and cucumbers. And lastly we have a problem we can take care of. That is damage by potato leafhoppers. 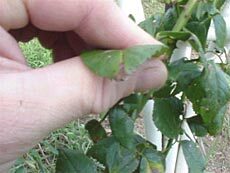 It is indicated by a brown or black "V" at the tip of leaves. A simple spray treatment of diazinon or carbaryl will prevent further damage. This picture happens to be a rose. Not all is bad, but it does make for some more dramatic pictures. If weather could be custom-ordered, it would involve about an inch of rain a week (and more than a tenth or two at a time would be nice), high temperatures of about 85 degrees and lots of sun. The next items coming to Lincoln Daily News from the Extension office will be fair photos. The Logan County Fair will officially open on July 31 and will run through Aug. 5. The 4-H shows have already begun, with foods and clothing exhibited before the fair. Dogs will show on the Saturday before the fair, and most project divisions will be shown on the Monday before the fair. Hope to see you there! [JULY 24, 2001] "Ninety-three percent of Logan County is farmland, and 97 percent of that farmland is prime land — that’s as good as you get," says Bill Dickerson. Preserving that prime black soil is a high priority for a group of local and national organizations. 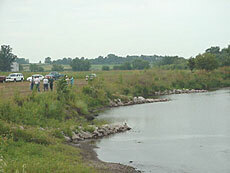 A field day sponsored recently by the Logan County Soil and Water Conservation District and the Land of Lincoln Soil Savers gave area farmers a look at a new stream stabilization technique, one way to control soil erosion. These two groups, along with the U.S. Department of Agriculture Natural Resources Conservation Service and the Illinois Department of Agriculture are working on projects to prevent Logan County’s waterways from carrying away its farmland. "With three good-sized creeks in the county — Salt, Kickapoo and Sugar Creeks — it’s a never-ending job," Dickerson says. As a district conservationist for the NRCS, Dickerson works closely with Logan County’s Soil and Water Conservation District. On Thursday he took a group of area farmers to a Kickapoo Creek site southeast of Atlanta, on farm ground owned by Dave Evans and Dan Koons, to explain a new technique called the stream barb system. What the farmers saw were three projections of large stone riprap jutting out into the creek, angling upstream, at a point where the creek had been cutting away the bank. The barb-shaped stone projections work together to catch the current and redirect it to the middle of the stream, away from the bank which is being eroded. The project was completed in December of last year, and, according to the landowners, is working just as predicted. "A few weeks ago, when the water was higher, I could see it working. I could actually see water turn and go back into the channel," Koons said. Before the barbs were put in, he added, the bank went straight down, because it was being undercut by the creek at the rate of at least a foot a year. Now the stream bank slopes, maintaining the angle it was given by the construction crew that put in the new stabilization system. The bank is also being held in place by the natural vegetation that is beginning to grow there. The new stream barb system is protecting about 600 feet of the bank of Kickapoo Creek, Dickerson says, preventing the loss of about one-half ton of soil per foot per year. That means 300 tons of prime topsoil is no longer washing down the creek, eventually ending up somewhere in the Gulf of Mexico. It is the nature of streams and rivers to meander, traveling in a series of S-curves, as they slow down and broaden out their flood plains, Dickerson explains. Formerly, engineers tried to keep streams from eroding the land around them by straightening them out, a process called channelizing. Kickapoo Creek was channelized on the Koons-Evans farm in the mid-1970s, when the land belonged to a different owner. Today the idea is to work with nature, allowing the stream to meander but preventing it from meandering too much, Dickerson explains. "Moving water is one of the strongest forces on earth. We are now going with the natural force of the stream, rather than fighting it." Although it’s the newest technique, the stream barb system on the Koons-Evans farm isn’t the only system on Kickapoo Creek that is keeping Logan County soil in Logan County. Two different projects upstream, called bendway weirs and similar to the barb system, are on land owned by Rodney Alberts and Jerry Cisco. They were also installed with the help of Dickerson and the Soil and Water Conservation District. These stream stabilization systems not only save soil, they also contribute to better water quality. They prevent streams from filling up with sediment and also prevent agricultural chemicals and nutrients from draining into waterways. Dickerson says the weirs and barbs are also good for wildlife. A degrading stream is sterile, providing little or no natural habitat. Rock bars, however, make good aquatic habitats, places for fish to hide or breed. Dickerson explained the process of constructing the stream barb system to the group of about 30 farmers who came to the site, pointing out that the average cost of installing such a system on a Logan County farm would be about $11,000. However, the Illinois Department of Agriculture has a $1 million program in place this fiscal year (July 1, 2001 to June 30, 2002) to help fund stream stabilization, and farmers who put in an approved system can get as much as 75 percent of the cost reimbursed. Several construction firms in the area do the work, Dickerson said, and the NRCS is ready to help farmers do the paperwork. A steam stabilization project usually takes about a year from start to finish because of the permits required -- from the U.S. Army Corps of Engineers, the Illinois Environmental Protection Agency and the Illinois Department of Natural Resources. The NRCS has been doing stream stabilization projects for the past 10 years, along with a number of other conservation programs. These include no-till farming, which according to Dickerson has contributed more to soil erosion control than any other program, and the Conservation Reserve Program, the USDA’s most popular conservation program. CRP allows landowners to take cropland out of production for as much as 15 years, getting payments of as high as $192 an acre for the idle land. The land can be put in grass for erosion control or planted with trees. Most land in CRP is already environmentally sensitive, Dickerson says, often located on a flood plain or on sloping ground. After viewing the stream barb system, the farmers adjourned to the Atlanta Park shelter, where they heard a program by Howard Brown, agronomist with Growmark of Bloomington. 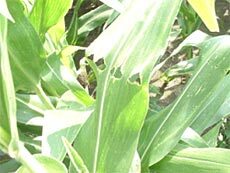 Brown walks the fields, looks at crops for indications of insects, fungus and other plant diseases, and gives farmers an update on how the season is progressing and what to look for when making decisions for next year’s planting. Brown said the yield potential for area crops this year looks good "if the weather is good from here on out." Anyone interested in more information about stream stabilization or other conservation practices may call the Soil and Water Conservation District office at (217) 732-2010, Ext. 3. [JULY 2, 2001] After the short course on corn, it is only fitting to provide a brief description of soybeans. Most people know what a soybean seed looks like. It is round and has two halves. These halves will later become the cotyledons (seed leaves). The hilum is the seed scar where the seed was attached to the pod, much like a pea. The embryo of the plant is attached between the two seed halves. The germination process is triggered when adequate moisture is available to swell the seed and the temperatures are generally over 60 degrees in the soil. The soybean is quite different than corn in that the cotyledons (seed halves) are actually raised out of the soil by the shoot as it grows longer. The cotyledons provide food for the young plant until leaves provide food through photosynthesis. After the cotyledons, a pair of unifoliate leaves comes out. The growing point of the soybean plant is the top part of the plant and always exposed. After the unifoliate leaves, the trifoliate leaves begin to emerge. These are the leaves that have the regular three leaflets that will make the food for the plant and seed for the remainder of the growing season. Soybeans bloom based on the length of the night. This means that the earlier varieties begin in late June and the other varieties commonly grown in our area will follow within the next 10 days or so. Most soybeans grown in the Midwest are of the indeterminate variety, which means they will continue to bloom and add leaves until they begin to die. Many of our soybean fields will have only about 25 percent of the flowers actually develop into pods and produce seed. Most plants in a field will have 30 to 100 pods on them, with two to three seeds per pod. One way we estimate yield is to figure four bean seeds per square foot equals a bushel. 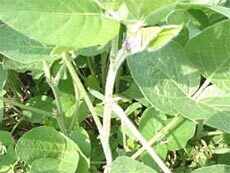 Soybean plants normally ripen in the months of September and October, depending on the maturity of the plants used. Most maturities in our area are either Group 2 or Group 3 varieties. Normal yields are from 40 to 60 bushels per acre, depending on variety, fertility, management and weather. The weather is the big factor each year in determining yields.